Bonjour paints presented the “Campus to Corporate “ mentoring program for students of SIESCOMS in association with Indian Merchants’ Chambers on 12 of Sept 2015 at their auditorium in Navi Mumbai Nerul. Bonjour group of companies is a well known established company in the paint industry . The company’s corporate social responsibility cell is activitily involed in various programs for the upliftment of the weaker sections of the society . Mr Ramaan Khuranaa, the chairman of Bonjour group of companies and the president of Global Punjabi Association and also the Co-Chairman, IMC, Navi Mumbai spared no effort to make the event possible and took extreme care to see that the participants greatly benefitted from the programme. He particularly selected 12th of Sept for this programme as a dedication to his mother who has inspired and mentored him. He also believes such programs will help to develop better quality of skilled employees for the corporate world, which is the focus of IMC for the year 2015 . Indian Merchants' Chamber is a premier chamber of trade, commerce and industry .in India with its head quarter in Mumbai. The Indian Merchants’ Chamber belives in nurturing and grooming young talents through their several mentorship programs . 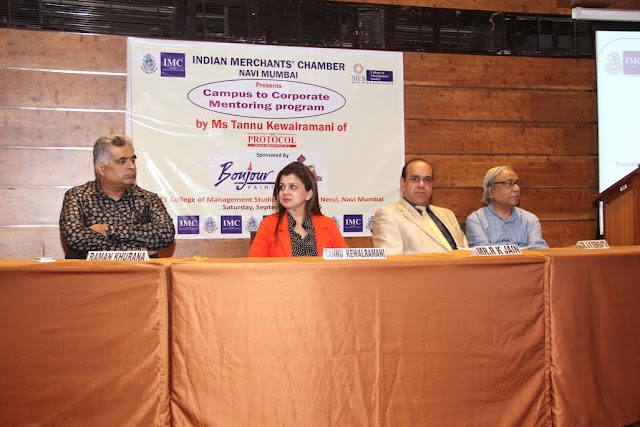 In Association of the Indian Merchants’ Chambers and the Bonjour group of companies a mentoring program “Campus to Corporate” was conducted by Tannu Kewalramani on 12thSeptember 2015 at the SIES College in Nerul, Navi Mumbai. This mentoring program was conducted especially for 150 select students of SIESCOMS who have been looking forward to attending such a program since it is known to help develop better quality of skilled employees for the corporate world. The programme presented an in-depth experience to the large gathering of bright youngsters providing a holistic approach to the image consulting, image training and image product. It greatly helped participants to enhance their appearance, body language, communication and etiquette that it considered very essential and a norm for ones authentic and optimal development made possible through the image consulting services. Dr A K Sengupta the mentor and the Director of SIESCOM is a very senior and respected educationist . Under his leadership and vision SIES college of Mangement is ranked 15th amongst top 50 B-Schools according to Business Baron magazine.